BMSA Elevating Mathematics Video Competition is Live! 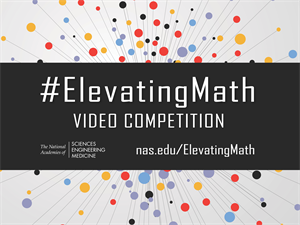 The National Academies of Sciences, Engineering, and MedicineBoard on Mathematical Sciences and Analytics (BMSA) "Elevating Mathematics" video competition is now live! With that in mind, the BMSA invites early career professionals and students who use mathematics in their work to submit short video “elevator speeches” describing how their work in mathematics is important and relevant to our everyday lives. This can be an unedited selfie video, an animation, or any other format. The BMSA simply wants to learn about why your work is important in 1-2 minutes. The winning video will be announced and played during the 2019 SIAM Conference on Computational Science and Engineering (CSE19) in Spokane, Washington. The winning participant will receive $1000 and be featured on the BMSA website. You do not need to attend the conference or be a SIAM member to participate. Learn more and submit your video entry!